BackCountry’s furry family members enjoyed an evening of getting their paws wet at the Sundial House pool. The dogs enjoyed the music, caricature photos, music and closing down the pool. From sno-cones to hula hoops and water slides to the water balloon toss BackCountry residents sure know how to enjoy one last summer bash at the Sundial House Pool. The Second Annual Run Wild 5K was a success! BackCountry families enjoyed a morning run on the South Rim trails right here in BackCountry. After the run everyone enjoyed a pancake breakfast from Flippin’ Flapjacks. The Easter Bunny and Little Bo Peep visited BackCountry during the Egg-Stravaganza event featuring an egg hunt, petting zoo and refreshments. Everyone had an egg-cellent time! Lucky the Leprechaun visited BackCountry for an adventuresome “Luck of the Irish” themed show at the Sundial House. BackCountry kiddos came dressed as their favorite princess and superhero for an afternoon of fun at the Sundial House. 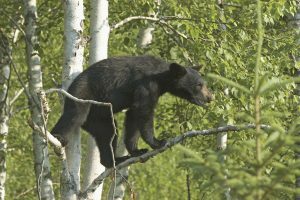 Elk, deer, coyote, red-tailed hawk, and black bear—these are just a few of the neighbors quietly going about their business in the rugged wilderness adjacent to BackCountry™. 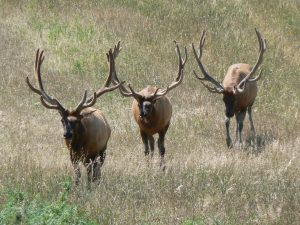 For the lucky humans living next door, the 8,200-acre Backcountry Wilderness provides breathtaking views, mind-clearing bike rides, memorable family hikes, and easy access to a year-round roster of nature programs hosted by the Highlands Ranch Community Association. “I think the greatest gift of living in BackCountry is having all the wonders of nature to explore directly in your backyard—without having to battle traffic on I-70 and the people once you get there,” says Lindsey. A nearby nature refuge can be especially meaningful to children. “We adults may remember playing in the creek in our neighborhood, but today’s kids have such a lack of time in nature,” Lindsey explains. “The Wilderness Area gives them the opportunity to engage their adventuresome spirits, to enjoy ‘free play’ in nature with no plans and no agenda.” They can even hang out with the draft horses, ponies, and chickens at the wilderness “base camp,” where most of the programs take place. HRCA’s programs are open to the public, but Highlands Ranch residents enjoy discounted prices. 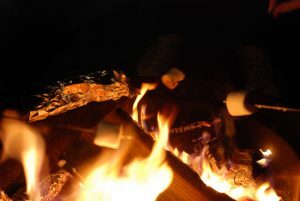 The winter schedule is more modest, but on Jan. 21, families can enjoy a mini-campfire hike with a campfire, s’mores, and free play—there’s a giant log fort and sandpit with horseshoes and more—all for just $5. (Think of it as a Saturday morning alternative to the playground.) Also, private hayrides through the wilderness area are available year-round, allowing you to see places the public simply can’t. Some programs take place indoors this time of year, such as archery lessons and a Feb. 4 Pizza with Pokémon event. Held at the Southridge Rec Center, live animals akin to those in the beloved game will come for a fun, educational visit. Warmer months bring back an abundance of outdoor events. Summer camps are a favorite, offering special focuses on art, adventure, horses, and leadership. Keep your eyes open for more about spring and summer programs in future blogs, but in the meantime, check out the many ways you can experience nature-in-the-suburbs on the HRCA website. BackCountry’s budding artists shined brightly during the community’s recent Kids-n-Canvas painting event. And what great presents those masterpieces surely made! The Sundial House turned into the North Pole for the kids of BackCountry. Holiday attire was worn, cookies were eaten, and letters were shared with St. Nick. After making sure everyone was one the “nice” list our residents enjoyed a carriage ride with Bella and Buster around the streets of BackCountry. ‘Tis the season to be jolly. Here’s how. Sometimes December feels more like the season to be busy, with the frantic pace of end-of-year work assignments, office parties, shopping, cooking, cleaning for house guests…well, you know the drill. Rather than simply reacting to every demand, consider taking a more proactive stance: What do I want my month to look like? What memories do I want to create? And then plan accordingly. Try subbing a few of these five memorable activities for other less-jolly obligations; there’s even one as close as BackCountry’s own Sundial House. Here’s to a happy holiday season…on your terms. This 42-year-old tradition remains the perfect way to kick off Denver’s holiday season. 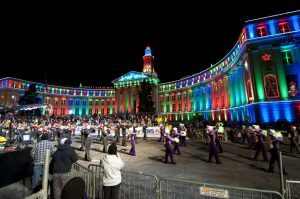 On a two-mile route in downtown Denver, this parade features marching bands, ornate floats, and, of course, special appearances by Major Waddles the Penguin and Santa. Dress warmly, take a thermos of hot cocoa, and stake out your spot along the route, or grab tickets ASAP for the limited grandstand seating in front of the beautifully lit City and County Building. Learn more. If you prefer smaller crowds or just staying closer to home, try on this special Highlands Ranch tradition. 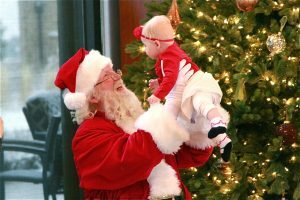 Hometown Holiday is an old-fashioned community celebration with caroling, entertainment, food, and a visit from Santa Claus himself. (Naturally, the big guy has a busy schedule these days, so catch him before he leaves at 7:30.) The tree lighting is planned for 5pm. Held at Town Center South. Learn more. This year, Chanukah, the eight-day Jewish Festival of Lights, stretches from December 24-January 1. Join your friends and neighbors for the celebratory lighting of the menorah at sunset at the Eastridge Recreation Center. The Menorah will be lit and there will be a special performance by the children of Chabad Hebrew School, latkes and donuts, and Chanukah arts and crafts. It is free and open to the whole family! Learn more. Imagine all 70 acres of the Denver Zoo, bright with illuminated animal sculptures that swing through trees, jump across lawns, and hide in bushes. 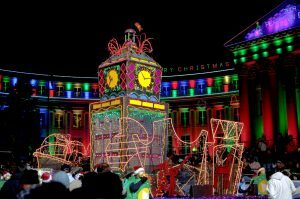 Plus, you’ll enjoy all the holiday carolers, Santa meet-and-greets, and much more at this beloved Denver tradition. Zoo Lights is a memorable way to spend time with family, get a little exercise, and, of course, support the animals. Tip: Go on a “Value Night” for smaller crowds and reduced entry fee. Tickets range from $10-17. Learn more. True, BackCountry™ is a bit of a hike from the North Pole, but the lure of cookies and photo ops with star-struck BackCountry kids brings Santa back year after year. Come enjoy time with your neighbors, wear your favorite ugly sweater or other festive attire, and have your kids bring their wishlists. Residents, RSVP through BackCountryLife.org by Monday, December 5th. Make attending at least one festive performance a holiday tradition in your family. The DCPA is offering something for everyone this month, from classics to new favorites in the making. Consider a musical performance of Rudolph the Red-Nosed Reindeer. The soaring majesty of Handel’s Messiah. David Sedaris’s hilariously snarky Santaland Diaries about his stint as a Macy’s elf. Or The Nutcracker, dazzlingly performed by the Colorado Ballet. Ticket prices vary. Learn more.